Recently I've become aware of a serious shortage in the Denver Metro area. Yesterday I promised my out of state home seller I would clean up a mess left by the landscapers. It was an easy 20 minute job of sweeping dirt off the sidewalk. No problem! I enjoy making things look better than when I found them so off to Home Depot I went to buy a fresh new broom. No luck. I ventured to Lowes. Still no luck. I went to Target, zero score. I drove to (yuck) Walmart, zilch. King Soopers, Safeway still no brooms. Not even at Whole Foods could I even find a earth-friendly handmade imported green sweeper! What's up? I called my Realtor friends in Colorado Springs, Pueblo, Boulder and Loveland. They reported the same problem. My son who works in Broomfield must certainly be able to find me a broom, nope! Zack said "Mom, it's hopeless!" We are living in a Broomless state! I wonder if the shortage of brooms has something to do with the rain forest people getting their way finally? Could it be the bristles are in short supply? Where do bristles come from anyway? Pig whiskers? Oh well it doesn't matter why there is shortage. What is important that we get the word out. 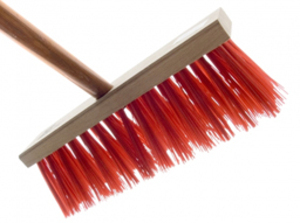 If you are relocating to Denver or moving to Colorado in fact, you better bring your own broom. Guess that means we are a BYOB state. Go Rockies! We love you! Well with Halloween coming up maybe the local witches are stocking up! I will have to look the next time I am at the local stores and see what the broom situation is here. I like Cyndee spoke to a local agent here who needs an agent in Denver. I gave her your name hopefully she will call you! Cyndee & Ines, please do check out the Florida broom situation. If you have extras we sure could use them up here! You are so clever KK - I'm with Cyndee...I need to check out the broom situation in Miami as well...maybe it's there's a national shortage and we have not even noticed. Kristal - Who knew this was a problem? Now I'm going to have to check out our broom situation here too!